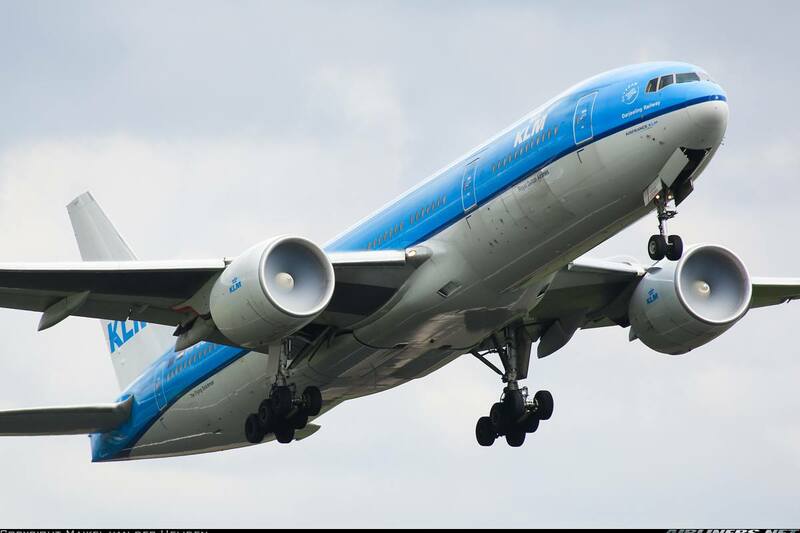 Welcome to my trip report on KLM! I flew with this airline before on SIN-DPS-SIN route (DPS: Denpasar Bali and SIN: Singapore) with the airline's Boeing 777-300ER. You can check out those reports over here. Part 1: Click Here! Part 2: Click Here! 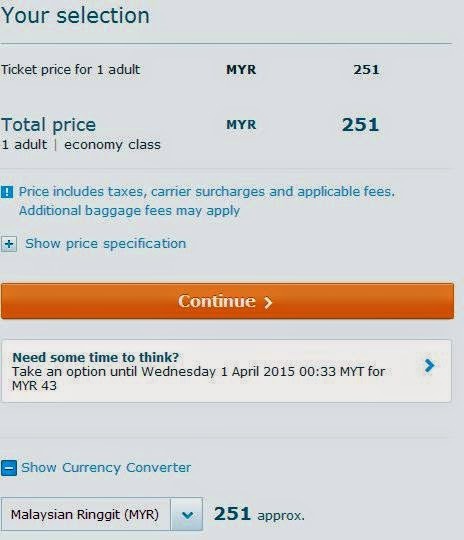 Why did I pick this airline to fly from Kuala Lumpur to Jakarta? There are a few reasons. 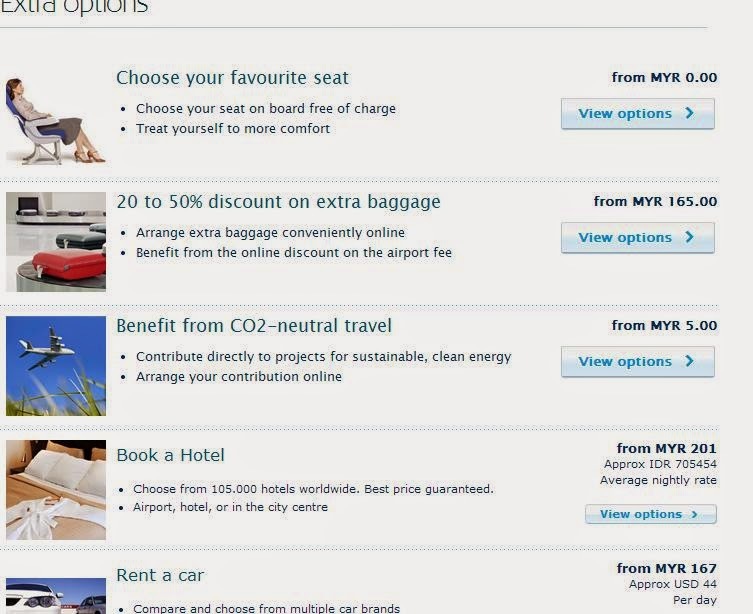 The S$90 one-way airfare was very attractive, I knew I cannot miss out on such a good airfare, it was $30 more than Malindo Air and which is also another good airline to fly with. The other 5th freedom flights on this route are Kuwait Airways (Trip report) and Lufthansa, both airlines operate the Airbus A340-300. Since I have flown with both carriers before, it only make sense for me to fly on KLM for the Boeing 777-200ER and according to the schedule, it was the old cabin (3-3-3), the new cabin is fitted with the unpopular 3-4-3 new Economy Class seats but I may fly that in the near future to compare with the old ones. The last time I booked with this airline, there wasn't much of a difference. Its website looks plain and basic but it has some cool functions that makes it easier for you to view. In my opinion, its one of the better ones out there. 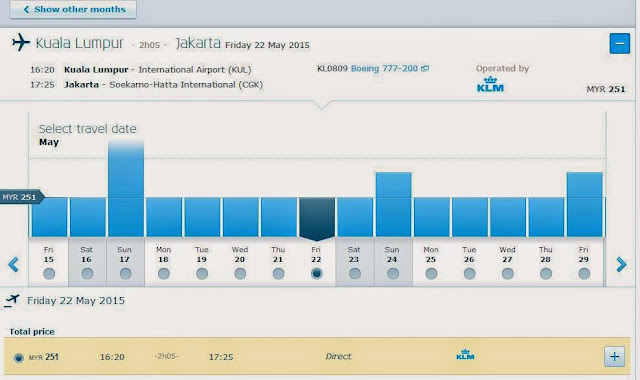 For this example, this bar chart shows the prices on these dates and fortunately, the chosen date was at the lowest fare. Once I clicked on that, I had an option to choose about it, at a fee of course good idea for long haul flights to check whether they are other better options while reserving a place. It also offers extra services which may be helpful. Choosing the seats is certainly very important to me! The Seat Map layout is pretty interesting and even using my Ipad to navigate, I had no problem at all. For a short flight like mine, it wasn't worth paying more for the better seats. I did consider flying on Business Class for this sector, but the price didn't justify it. S$300 for the one-way sector on Business Class and $90 for Economy Class, I rather save the extra money for other things. Filling up the necessary information and making the payment was a breeze for me and you can also do your booking on the user-friendly mobile app available on both Android and IOS devices. I thought this is pretty cool. 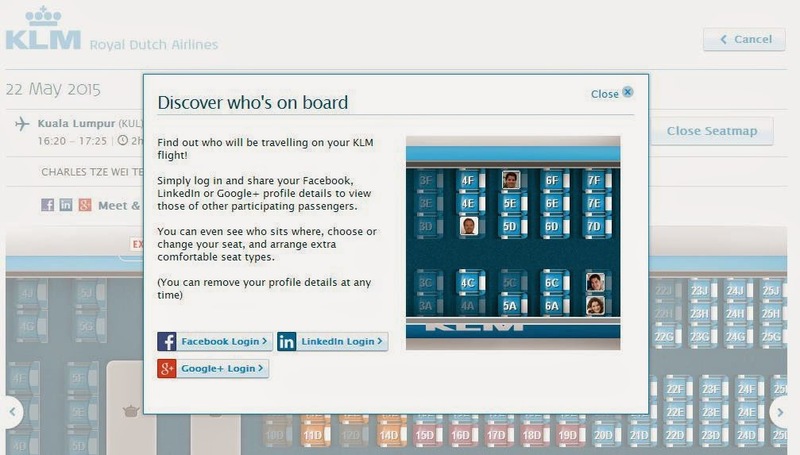 Getting to know your seat mates of participating passengers, would love to make more friends this way! User-friendly - it has pretty much the same functions as the website's. 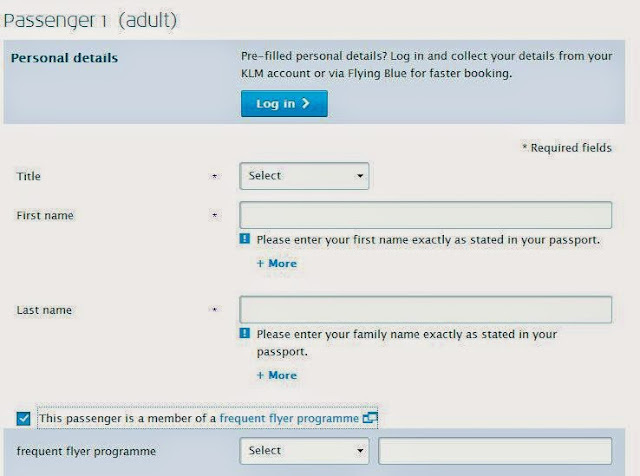 Once you key in your PNR into the app, the good thing is it will store your flight details, that means the next time you use the app, you can refer to your trip details without the need of keying in any numbers. It gives you the necessary information. Choosing the seat selection may take a while, but no issue with choosing the seat. Layout is similar to the website's. Initally I chose seat 35A - one of the regular seats. There are options for you to upgrade yourself to either a better seat or to Business Class, I didn't consider doing so as it was a short haul flight and it didn't justify enough reason to fork out the extra bucks to upgrade myself. Since the Economy Class is in the 3-3-3 seating configuration and the duration is short, I didn't need to think twice about it. The day before, I did my online check-in with my mobile phone. I decided to change my seat since both seats, 35B and C were occupied and I hope the seats beside mine at 39 were not, at that time. I regretted it. The passenger beside me had an attitude problem towards me, was it because of my skin colour? Maybe. I hope I won't bump into him again. Dislike this kind of people with a passion! Checking in online is as easy as ABC. Its better for you to do so as you get your seat and also avoid the long queue at the check-in counters. I stayed overnight at the Premium Lounge Plaza at KLIA2, the review can be found here. I checked out at around 1 in the afternoon and made my way to KLIA by train. The ticket costs only RM2 and it takes less than 5 minutes to reach there, there is an online timetable for the train schedule, you can check it out over here. Once I reached the train station at KUL, I took the lift up to the departure hall and headed to the check-in counters. The check-in process went smooth and the only question the staff asked me was about my return flight, and I told her I was flying on Air France from CGK-SIN. Notice the Oman Air flights? They are code-share flights with Malaysia Airlines, operating using MH's aircraft. Checking my flight, KL809, the check-in counters were opened. I joined the baggage drop-off section, the queue was much shorter than the normal queue. If you want to avoid the queue, remember to do your online check-in. After that, I did a check on which aircraft was talking me to Jakarta, and it was PH-BQD. A day after, PH-BVD - the Boeing 777-300ER in Skyteam livery flew in. I made my way to my favourite cafe at KUL, the Secret Recipe which offers decent cakes and they are cheaper than the ones in Singapore. After that, I went to the airside and check the status of my flight. Did a bit of plane spotting along the way! One day, I will give Biman Bangladesh Airlines a try! This is where my flight was departing from. PH-BQD has just arrived, looking very smart in the old livery. The flight ended up almost full and one of the passengers had to be offloaded due to medical condition and this caused the flight delay. It doesn't matter to me, the passenger's life is more important. The Captain asked for a doctor on board and he explained to us about the situation, so we were aware of what's happening. Credit to the Captain for keeping us update, no one in my cabin section made any comment or anything. The right engine cover was opened and that caused a concern for me, was the flight going to be delayed? Fortunately, it wasn't the case. The flight was delayed but it was for another reason. Transit passengers had to disembark from the aircraft and the holding room was pretty crowded, not surprisingly that most of the rows especially at the rear were occupied. Surprisingly, boarding started at 4pm and everyone settled down about 20 minutes later. I guess the right engine problem was fixed since we were allowed on board. After settling down for about 10 minutes, an announcement by the Captain requesting for a doctor to help assist a patient's condition. I am not very sure whether anyone did but the patient was offloaded with his/her luggage and we pushed back about 9 minutes after our schedule departure. Not the airline's fault, as this is part and parcel of flying, what is more important is the speedy recovery of that passenger. 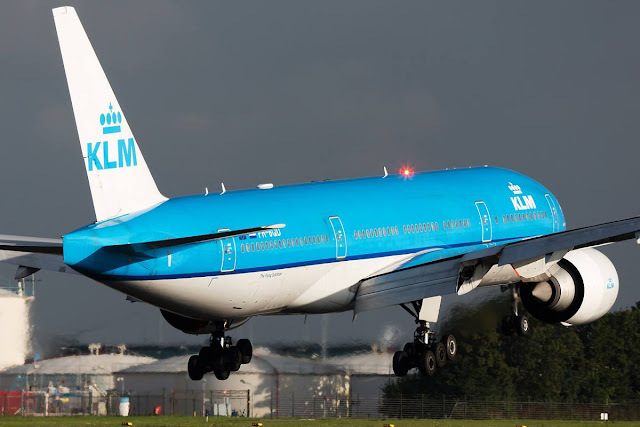 This batch of Dutch crew was hardworking, they were seen walking up and down, busy with the preparation while attending to some passengers' needs. My first impression of them was positive as they greeted me while walking towards my assigned seat. Once everything was settled, the aircraft pushed back, and we headed to runway 32R for the 1 hour 40 mins flight to Jakarta. The layout is in the old 3-3-3 seating configuration and the IFE system is of the first generation (Non-Audio Video On Demand). However, the airline has upgraded some of the Boeing 777-200ERs to the new cabin which all Boeing 777-300ER would also have . Economy Comfort - seats that offer better leg room space, 33-34' inches, useful for long haul flights. An almost window-less seat, you have to bend forward in order to enjoy the outside view. Can you see the legroom space? I chose a seat at the rear cabin hoping for empty seats behind. Folks that like blue colour should fly with this airline! The tight seat pitch between the rows of seats. I am not in the wrong class! For Emergency row, picked either the middle or aisle seat. Not much window view and limited legroom space at the window seat. Pillow is provided in every seat. Here it is, I finally reached my seat. Leg room space I believe is around 31-32' inch, its reasonable for a short-medium haul flight. Anything longer than 4 hours, I would pay for the Economy Comfort. The tight legroom space with a big sized passenger sitting beside me, I felt pretty uncomfortable midway though the flight. The first generation batch of IFE system that will be phrased out for newer ones in the near future. While my seat mates were not there, I quickly snapped a few more shots. I wouldn't want to be sitting in the middle. Everyone was settled, we were waiting for the sick passenger's luggage to be offloaded, the crew walked around to ensure that we were all comfortable and belted up. Unfortunately for the seat mates, I had to use the toilet twice that means they had to get up to let me access the aisle, that's why for long haul flights, aisle seat is the option for me. The passenger standing was waiting for me to return. Few more shots of the Economy Class photographed after arrival. 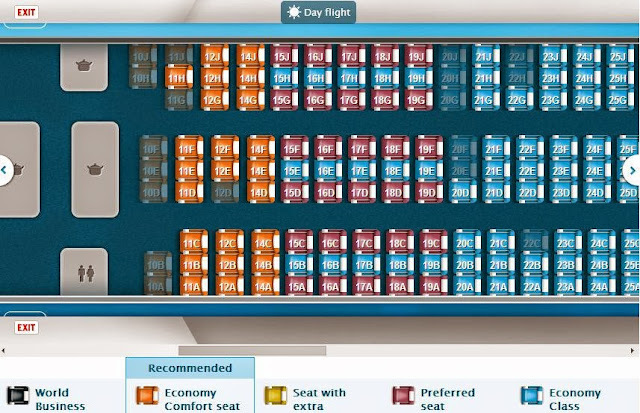 I will certainly miss the 3-3-3 seating configuration on KLM's 777-200ER. Overall, I find the Economy Class seats slightly uncomfortable and the cabin has too much blue in it in my opinion. The 3-3-3 layout suits the 777 which is just nice for the passengers. Its different from the Boeing 777-300ER's cabin. One question came into my mind, where are the PTVs? Well, they are the foldable type, stored at the hand rest there. Comparing this to my previous flight with Oman Air, the business class is way better than this. Paying $300 for this old business class seat on a one way ticket doesn't justify at all, sorry to say. Lots of airline's business class is in the 2-2-2 layout but this 2-3-2 layout just doesn't do it especially for fussy business class travellers. The cabin crew were nice and they came around distributing custom forms and a snack bag and drink for us. I was surprised for an hour and 40 minutes flight, hot meal was not served especially it was closed to dinner time. Kuwait Airways served us a hot and delicious meal on this same route. Strange! You can check out my Kuwait Airways Trip Report over here. Quite a number of passengers were asking whether was there a 2nd option, the crew was nice enough to apologise and explained that everyone gets the same which is this. I chose coke to go along with it. At that time, I was feeling hungry, this was not enough to satisfy my hunger. It was not bad, a little spicy but enjoyable. Like I mentioned earlier, a hot meal on an afternoon flight of 1 hour 40 mins sounds reasonable. China Airlines and EVA Air serve hot meal on a 1 hr 10 minutes flight, if they can do it on a packed 747-400, so can KLM and Turkish Airlines (BKK-SGN)! Perhaps its part of the cost savings? Who knows! The remote control is located at the side of the hand rest. The remote control has 2 sides, one is a controller while the other side can be used as as mobile phone. This earpiece is complimentary. You can take it home. Checking out the IFE system, movie selection is limited. There was Wifi on board, but couldn't be connected, don't think its meant to anyway. Took some window shot photos but few because of how dirty the window was. I didn't find the cabin interior and the IFE system appealing especially if I have to fly long haul in it. Yes, the airfare may be cheaper than the others, but for a well known brand in the airline industry, you expect something better. Fortunately, this airline have already started changing both the interior of the Economy and Business class, so I expect something better for the IFE products. From a passenger point of view, its disappointing to hear that the current layout of the Boeing 777-200ER would be changed to the 3-4-3. the same type of seats would be used on both -200ER and -300ER, good for the airline but bad for the passengers. On the other hand, I am willing to give the new product a try, I hope it won't turn out to be worse than the current product. On the positive note, this airline has engaged itself well with the social media, hopefully it takes note of the passenger's comments and reviews, improving to be even better than before. You can be assured of the airline's reliability in terms of safety and on-time punctuality, but sometimes that can be beyond the airline's control (Technical problem or Weather). This airline is one of the better ones in the Skyteam alliance, so if you are considering flying with this airline, go ahead. Hi Charles, if the flight has onboard wifi, it is usually paid...I did the same when I'm on emirates.